Thirteen gene clusters involved in non-ribosomal and ribosomal synthesis of secondary metabolites with putative antimicrobial action have been identified within the genome of FZB42, the model for Gram-positive biocontrol strains. These gene clusters cover around ten percentage of the whole genome. Antimicrobial compounds not only suppress growth of plant pathogenic bacteria and fungi but could also stimulate induced systemic response (ISR) in plants. Recently, it has been found that besides secondary metabolites also a blend of volatile organic compounds (VOCs) is involved in the biocontrol effect exerted by FZB42 against plant pathogens suggesting complexity of biocontrol function. Cyclic lipopeptides and volatiles produced by plant-associated bacilli trigger pathways of induced systemic resistance (ISR), which protect plants against attacks of pathogenic microbes, viruses, and nematodes. 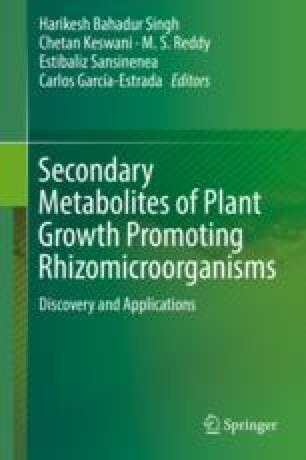 Stimulation of ISR by bacterial metabolites is likely the main mechanism responsible for biocontrol action of FZB42.